Women make up half of the professional workforce, yet only 18% of women hold top leadership positions and only 1.3% of women are founding startups. Not to mention the fact that women earn only 77 cents to a man’s dollar. These are just some of the statistics that were shared with Women in Renewable Energy (WiRE) in a breakout session as part of the organization’s visit to MaRS and the cleantech practice this past Tuesday. 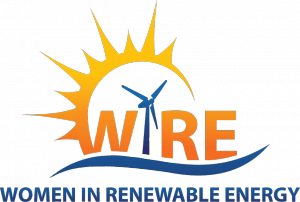 WiRE educates and connects with women in the energy space in Ontario with the goal of increasing women’s literacy across a wide range of applications related to renewable energy. 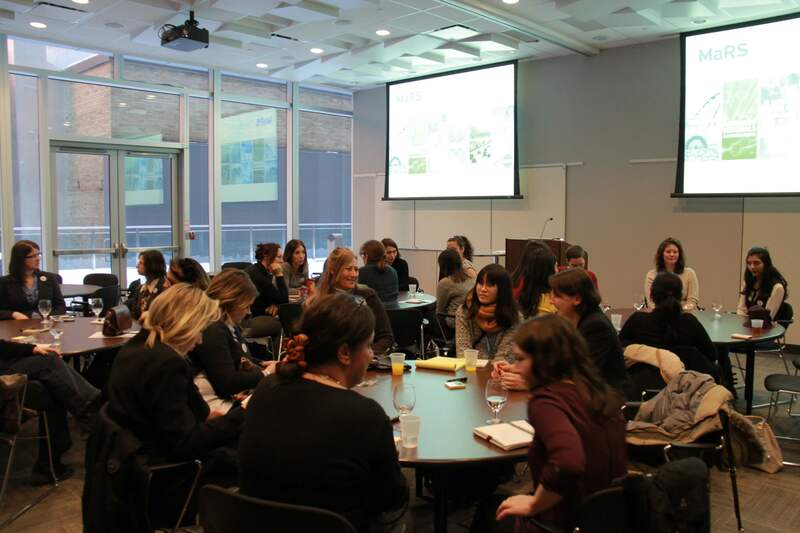 The non-profit organization offers a platform for learning and networking in the hopes of enabling women to advance their careers in the energy industry in Ontario. It is in this light that WiRE joined MaRS in a conversation about the status of women in entrepreneurship and the tech sector. Here are some of the questions we touched upon. Does a woman’s academic background impact her opportunities to work on a technological innovation, participate in a startup or acquire venture capital? Does like hire like? Does like fund like? At what point are women participating in startups? What are the effects of female leadership in startups and in larger established companies? What can be done to change the status quo and what will we do differently tomorrow? Progress has been and is continuing to be made. Women now hold more bachelor’s degrees than men in both Canada and the United States. However, in the US women make up only 24% of science, technology, engineering and math (STEM) undergraduate students, 18.4% of engineering students and 18.2% of computer science students. A similar structure is reflected in the workforce. Today, women make up only 24% of the Canadian tech-sector workforce and only 27% of the Canadian emerging technology workforce. Clearly, more progress is needed. 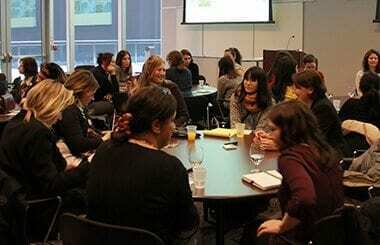 When do women get involved in startups? According to a Dow Jones VentureSource study titled “Women at the Wheel: Do Female Executives Drive Start-Up Success?” only 1.3% of privately held companies had a female founder, only 6.5% had a female CEO and only 20% had one or more female C-level executives. Another insight from the report is that while women may not often be founders of startups, they are often involved when companies are profitable. Companies that have one or more female executive leaders are more likely to fall into the profitable category than companies with no female leadership. According to the study, 66% of profitable startups have at least one female executive on board (see table below). This could imply several possibilities: that companies hire more female executives as they advance; that women are more likely to join a startup if they feel it will be a success; and/or that women leadership is behind this success. Be sure to read the report for more interesting analysis. At MaRS, 22% of the ventures we provide advisory services to have one or more female founders and 16% of entrepreneurs are women. Two out of 163 cleantech companies have female founders (nine if you include founders and executives). This is why events like this one are so important. Last year, MaRS Data Catalyst conducted some research into the status of women in venture capital in Canada. They found that 63% of venture capital firms in Canada had no female executives. The next phase of research will look to see if a correlation exists between the gender composition of a venture capital firm’s investment team and the gender composition of the startups that these firms invest in. According to research conducted by the Ewing Marion Kauffman Foundation, companies operated and venture-backed by women have 12% higher revenues and 35% higher return on investment (ROI) over companies operated by men. Further, according to a Catalyst report, Fortune 500 companies with at least three women directors saw a 66% increase in ROI and a 42% increase in sales. 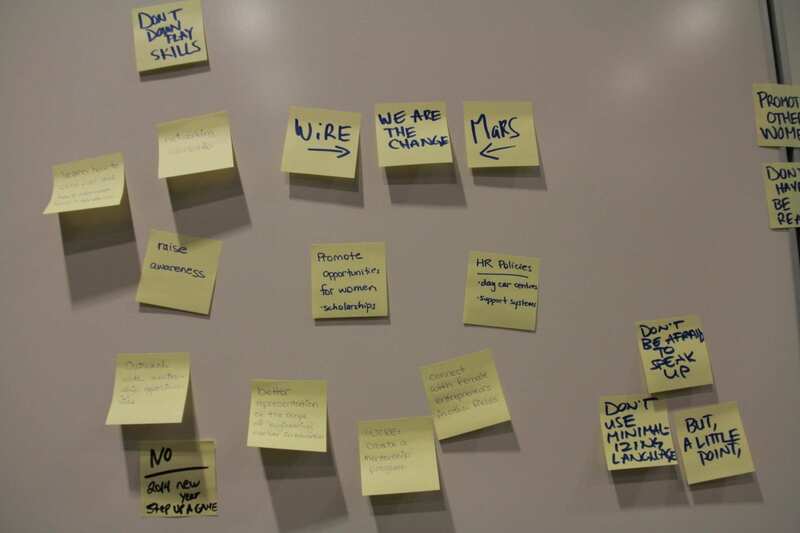 The participants of the WiRE field trip to MaRS filled Post-it notes with their thoughts about what can be done to change the status quo. Here are some of their ideas. Offer outreach to girls to recruit them to STEM subjects and really drive home the scope of opportunities that STEM subjects can provide. Hold workshops on how to build confidence, how to network and cold call, how to ask for a raise and how to avoid low-balling your initial pay offer with a new job opportunity. The WiRE women and participating MaRS clients convinced me that tomorrow I should speak up, play up my skills and be a presence.